On 1 September 2014, the Euro 6 European anti-pollution standards came into force, and on this occasion there were new stipulations relating to the reduction of emissions for light vehicles with a diesel engine. As can be seen in the graphics, the new EURO 6 standard has evolved with the objective of substantially reducing nitrogen oxides (NOx). NOx, as this gas is generated under high pressure and temperature conditions. From some time now exhaust gas treatment systems have been used, one of the best known by professionals in the sector is the exhaust gas recirculation system EGR, this consists of reducing the creation of nitrogen oxides (NOx), by introducing burnt gases from the exhaust into the cylinder. With the new emission limits required by EURO 6, many engines (especially larger capacity engines) will not achieve the target required by the standard. This technology started in the industrial, agricultural and heavy machinery vehicle sector, and is the same system (with just small differences) that is currently installed in passenger cars and light commercial vehicles. 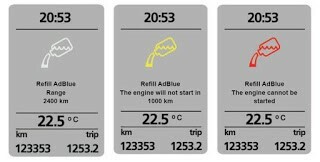 AdBlue is an additive in the form of an aqueous solution made up of 32.5% urea and 67.5% water. This is not a flammable product, it is safe to handle and in general is not a hazardous substance for people or the environment. Additive tank: this has a capacity of approximately 20 litres and is usually located under the vehicle next to the fuel tank, it can also be located in the cavity left by the spare wheel. Internally, the tank has a built-in pump, a level gauge and an electric heating system. Injector: this is installed in the exhaust line, it is controlled electrically by the control unit and is responsible for dosing the additive directly into the exhaust. 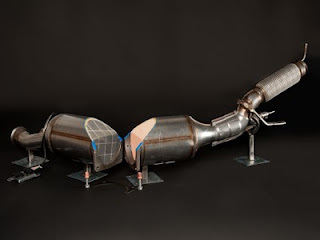 SCR catalytic converter: This is a "Selection Catalytic Reduction" type converter, it is a ceramic monolith inserted in the exhaust pipe that can be located before or after the particulate filter. The particulate filter (FAP) is responsible for removing the particulates. The catalytic converter (SCR) is responsible for removing the NOx. It facilitates the chemical reaction that will remove the nitrogen oxides generated by the combustion of the diesel oil. Nitrogen oxide (NOx) sensor: this sensor can detect the presence of NOx. It is installed downstream of the SCR catalytic converter in order to verify that there is no NOx at its outlet. If the AdBlue system malfunctions in any way and NOx is emitted, the sensor detects it and informs the system's control unit. 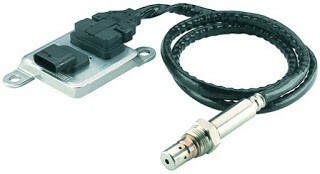 The NOx sensor has an integrated electronic module (inseparable assembly). Control unit: this is the electronic unit that manages the system. Unlike in industrial and agricultural vehicles where this is a separate unit, in passenger cars, the AdBlue management functions are integrated into the same unit as that for engine control. The operation of the system is very simple and with few complications. The process is started when the exhaust gas is hot (approximately 200°C), from this moment the control unit activates the electric additive supply pump (fitted inside the tank), which ensures the correct supply of additive to the injector. When the unit activates the injector's electric control, it dispenses the amount required into the exhaust pipe (approx 1 litre of additive every 1000 km). A chemical reaction takes place inside the exhaust pipe and the additive (AdBlue) undergoes a transformation which produces ammonia (NH3). The exhaust gases and the ammonia (NH3) enter the reduction catalytic converter (SCR), the ammonia reacts with the nitrogen oxides (NOx) and transforms them into nitrogen and water. The additive tank empties over the miles and the vehicle user will be informed via a message on the instrument panel that varies depending on the range. As you can see, if the driver ignores the warnings, eventually the starting of the engine will be prevented. Depending on the manufacturer and the current warning level, the system will normally have to be reset by means of a suitable diagnostic tool (after filling the additive tank).